Tickle Water presents the next generation of the first and only premium sparkling water created solely for kids to the press at the 2017 Consumer Discovery Show, taking place at Spring Studios in New York City on Friday, November 17 from 10 a.m. – 4:30 p.m. and Saturday, November 18 from 10 a.m. – 5 p.m. Since launching in 2016, Tickle Water has grown quickly, delivering honest, transparent, clean hydration that parents can feel good about and kids love. Now, with the launch of Orange Mango, there’s a flavor for grown-ups to love. The Consumer Discovery Show (CDS), curated by FounderMade, builder of emerging consumer brands in the health, wellness, beauty, and food and beverage sectors, will feature an impressive lineup of consumer goods business pioneers, as well as more than 150 inspiring brands that are out to reshape the consumer goods market. “We’re thrilled the new flavors in our product line strike a chord with adults. As a busy and health-conscious mom, my first goal was to create a trusted, healthy water brand for kids. It’s a fantastic evolution of the brand that adults want a clear and refreshing on-the-go drink that does double duty as a bright zero-calorie mixer for cocktails” said founder and CEO Heather McDowell. Like all parents, Heather was always on the lookout for alternatives to sugar-laden juice boxes and carbonated drinks. The spark for Tickle Water came when she offered her toddler sparkling water for the first time. “It might tickle,” she told him. He took that first sip, laughed, and said, “Tickle water!” The name stuck. 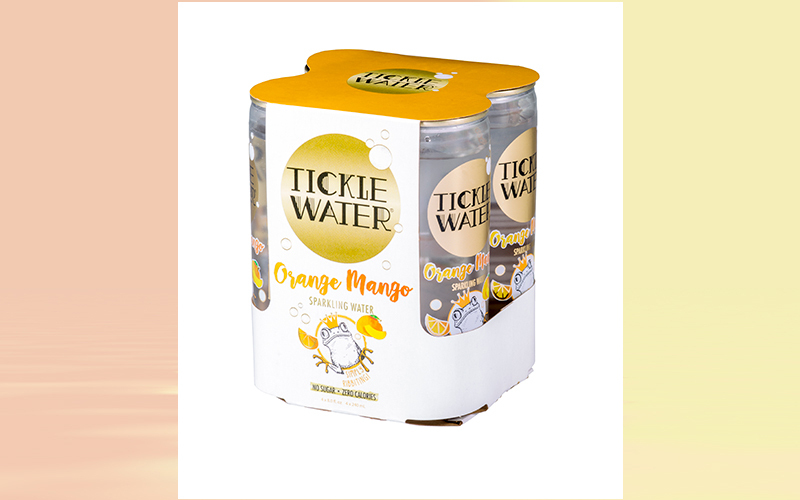 A year later, Tickle Water has become a breakout brand in the highly competitive beverage industry. The idea was simple: create a clean sparkling water experience for kids. It had to be just the right size with a super cool package, have the perfect amount of bubbles and, of course, it had to offer amazing flavors. Tickle Water’s following among adults has happened organically, the brand quickly becoming a go-to sparkling water for young adults and millennials. Since its inception in early 2016, Tickle Water has disrupted the flavored sparkling water segment by offering a healthy and enjoyable sipping option specifically for children that quite literally “tickles” their taste buds. Tickle Water is a naturally flavored sparkling water free of preservatives, GMOs, gluten, sodium, sugar, calories and artificial sweeteners. Additionally, all products are certified OU Kosher. The current lineup of all-natural flavors: Orange Mango, Green Apple, Watermelon, Grape, and Natural Sparkling Water are changing the beverage landscape with parents and children alike. The CDS connects best-in-class consumer brands and product innovators with retailers, distributors, investors and influencers. It’s the world’s gathering place for the confluence of next generation brands looking to drive business, and for the consumer goods ecosystem looking to discover the latest in consumer product innovations.